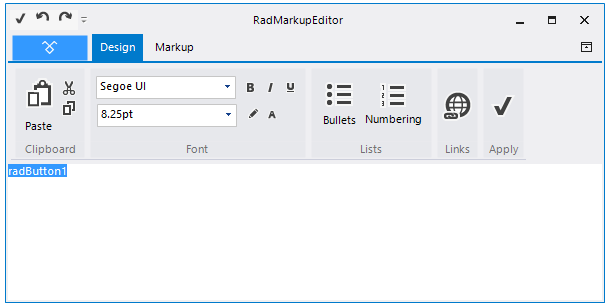 RadMarkupEditor is a dialog used at Design time and Run time for creation of the formatted text supported by our WinForms suite. As any other standard dialog in WinForms, this dialog inherits from CommonDialog class. Alternatively you can edit the Plain Text field if you need not HTML-like text formatting. Please note that you can still use the Plain Text field to edit HTML tags manually. When started at Design Time, the font size and name are taken from the edited control or visual element e.g. RibbonTab. No tags are added for this font in the generated markup although the font name or size can be explicitly set as well. 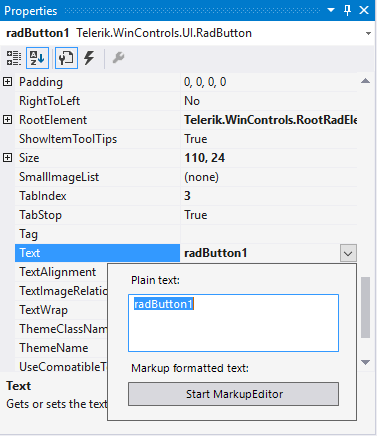 In order to use RadMarkupDialog at RunTime, add reference to Telerik.WinControls.RadMarkupEditor. ShowDialog returns the DialogResult enumeration. The returned value is DialogResult.OK if one of the Apply buttons is pressed and DialogResult.Cancel if the Close button is pressed. The Value property contains the edited HTML as a string. RadMarkupDialog depends on Microsoft.mshtml assembly. Please refer to the Deployment section for further details. 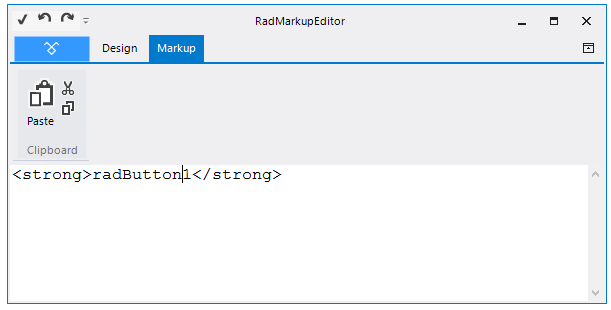 The user interface of RadMarkupDialog should be fairly intuitive. The two tabs - Design and Markup - are used for navigation between design and markup views. The first RibbonBar group (Clipboard) contains the Paste, Cut, and Copy commands. The second RibbonBar group (Font) contains the Font-Family, Font-Size, Bold, Italic, Underline, Highlight, and Font-Color commands. The third RibbonBar group (Lists) contains the Unordered List, and Ordered List commands. The fourth RibbonBar group (Link) contains the link command. The fifth RibbonBar group (Apply) contains the *Apply *command. You should click this button to persist your editing at Design Time or to receive DialogResult.OK at Run Time. Otherwise (pressing the close button of RadMarkupDialog), the change will not be persisted at Design Time or DialogResult.Cancel will be returned at Run Time. Markup view contains only the clipboard commands.